Now That’s Cool! Effective Cooling with Ground Loops | What's NEW at EcogenBuild? Don’t forget about the OPEN HOUSE this weekend – Sat., June 25! We did it: Natural Cooling! Once again, what was design on paper has been proven to work in real life. The same radiant floor system that puts heat into the house and moves it around, can also take it out. By coupling it with the tubes that we buried underground when we built the house, we’ve been able to cool the entire house down to levels even at the low end of what is comfortable. Moreover, we do it for the same amount of energy it takes to light up three LED bulbs! So, yes, it works…really well! How it Works. In the simplest form it goes like this: build a really efficient house, add lots of thermal mass in radiant surfaces, then add or take heat away in an environmentally-friendly manner with a hydronic system. Effective passive solar design: let the sun in during the winter when you want it’s heating, keep it out in the summer when you don’t. Super-insulated everywhere: below slabs, foundation walls, above-grade walls, attic. 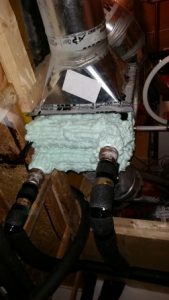 Insulation bought once is far cheaper than energy paid for repeatedly in heating and cooling seasons. Super air-tight: using a blower door we bought for use throughout the building process, we measured 0.31 ACH 50 (that is 0.31 air changes per hour at a pressure differential of 50 Pascals with the outside); that’s about 15 times tighter than the average home. Very effective ventilation with efficient heat and enthalpy recovery. This gives lots of fresh air so that we don’t have to rely on a leaky envelope to maybe keep us and the house healthy. On top of that, we have very efficient recovery of the energy from the indoor environment: the heat and water vapour we just paid for in the winter and the cool and dry air we just created during a summer heat wave. Our ERV does that for us. Ventilation heat exchange coil. Coil tube bends were insulated where they emerged from the heat exchanger because significant amounts of condensation were dripping from them. This recipe is called “Passive House”. That is the start point. Floors of concrete (slab in basement, over-pour on upper floors) do this job. First job of the thermal mass is to absorb the sun’s free heat without the indoor temperature rising outside the zone of comfort. The second job is to release that heat over periods when the sun is not giving it. The third job is to spread the heat: concrete is a good conductor and keeps surface temperatures evenly distributed. Absorb the thermal energies within the house: from sunlight, people, appliances, etc. Again, keeping the temperature from swinging too high, too rapidly. Conduct the heat around to keep temperatures evenly distributed. 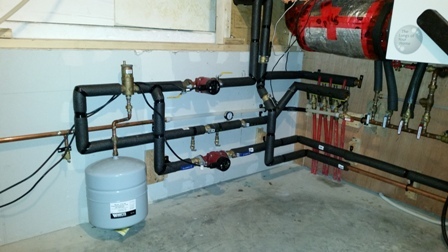 Provide a “sink” from which the hydronic system can remove heat. Assists the redistribution of passively-gained heat from parts of the house that get it to parts that don’t get it, like the basement and North-facing rooms. Adds heat effectively when needed, but not too much so that capacity for passive gains is used up. A properly set-up heat source does this; a boiler or heat from thermal storage. Moves heat around within the thermal mass (or “coolness” from areas with lower levels of heat energy). Removes heat from the house’s thermal mass. That could come from a heat pump or a cold store. In our case the cold store is the deep soil where we buried ground loops. The trick is effective design of the hydronic system to do these things with thermal storage and ground loops: that’s part of what we do differently from others. Heating: ultimately, this house is designed for heating with a solar thermal system where energy is stored seasonally, but we launched in the winter using what will eventualy be the back-up thermal system. Fortunately the house is so efficient that our heating costs have been quite reasonable even though we were using a very expensive energy (electricity for the boiler). Cooling: accessing the cool, deep soil is all we need to provide sufficient cooling capacity for the house. The low level of heat gain in the house is matched with sufficiently sized ground loops to remove the heat fast enough to cool the house down and to keep it there. Again, it comes down to design: knowing how much heat needs to be removed, knowing how to move it effectively and efficiently, and ensuring that there are appropriate conditions to “dump” it into the soil, and with sufficient capacity for the job. Ground loop manifold and pumps for radiant hydronic surfaces and ventilation cooling coil. Sensible and Latent Heat. So, yes, we cooled the house down. That’s “sensible” heat, but it is only part of the equation for comfort. So what about the humidity? That’s dealing with the latent heat and it is also a big part of how we make the house comfortable. Part of our design uses a heat exchange coil in the ventilation system fresh air supply duct, where it comes out of the ERV. It uses ground loop water to cool that air down; providing some cooling, but also reducing the humidity when the conditions permit. That is when the ground loop is providing water at about 11°C and when the relative humidity of the indoor air is about 60% or higher. At those times we experienced a very good rate of condensation/removal of water from the air. As the system is currently configured, we run either radiant cooling or ventilation cooling, but not both concurrently. The reason is that the floors remove far more energy than the ventilation system, but they also raise the ground loop temperature to the point where condensation doesn’t occur. An improvement would have independent ground loops for each system. Fortunately, we don’t need to run the floors often, except during heat waves. The back-up, of course, is a dehumidifier. When we close-up the house, the dehumidifier is in fact the biggest energy consumer: using greater than ten times more energy than the radiant cooling system. Looking ahead, we are conceiving ways to effectively remove humidity with natural sources of energy and lower energy costs without the use of the dehumidifier. However, using the energy-thirsty dehumidifier is still a reasonable solution given that we’ll soon have nicely sized PV (solar electric) systems (two of them) installed. The power generated by the PV systems will coincide nicely with the need for cooling and de-humidification – sunny days drive the need for heat, but they also mean more electrical power generation – so they kind of cancel each other out. By improving our system, we’ll make it so that we use even less energy, arriving at the level of perfect comfort we’ve already achieved, but by using much less energy again. Requires extremely little energy and operating cost. Adds very small incremental cost to the hydronic system. Has virtually no environmental impact. Is also ideal for an off-grid lifestyle. Is easy to control and maintain. The key to making the system work is in the design of the house and it’s HVAC together as a system, good installation and attention to detail in the commissioning. Open House: Saturday 25 June. It starts at 9AM with tours each hour on the hour and the last tour at 2 PM. If the weather remains hot, you’ll get a chance to experience effective, efficient, natural, cooling. Off-Grid PV System. We’ve taken delivery of an off-grid PV system that will provide power for the critical systems in the house like ventilation, well pump, refrigerator, hydronics (including ground loops), some lighting and plug loads, and the future solar thermal system. Grid-tied PV system. Also ready to go: a 7 kW grid tied PV system, seven modules of which will pull double duty, acting as our awnings above the South-facing windows on the first floor.